Select the SERIES 2000 Magnehelic® Gage for a versatile low differential pressure gauge with a wide choice of 81 models and 27 options to choose from. Using Dwyer’s simple, frictionless Magnehelic® gage movement, it quickly indicates air or noncorrosive gas pressures--either positive, negative (vacuum) or differential. The design resists shock, vibration, over-pressures and is weatherproof to IP67. Select the –HA High Accuracy Magnehelic Gage® option for an accuracy within 1% of full scale. Also included with the –HA option at no extra cost are a mirrored scale overlay and a 6 point calibration certificate. • High accuracy option is twice as accurate as the standard Magnehelic® gage. 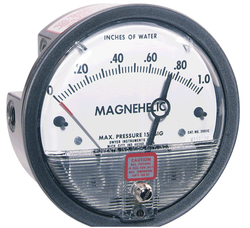 Looking for Magnehelic Gauges ?